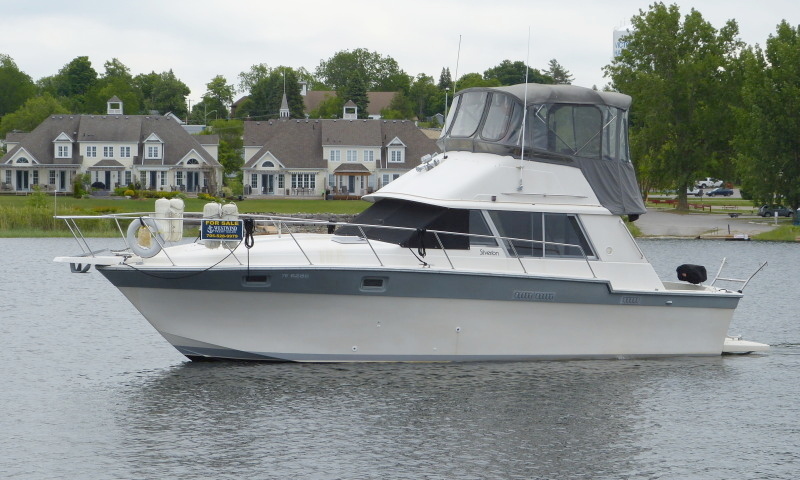 Power Boat Guide says "Built on a solid fiberglass hull, the rakish styling of the 34 Silverton has held up well over the years. A single stateroom, galley-down floor plan that sleeps 6 in comfort with the convertible dinette, pull-out sofa and V-berth cabin." The V-berth in this Silverton Convertible has been very tastefully customized with the bed filled in with cupboards added below for clothing storage. The cockpit with glass sliding door is a wonderful place to entertain and BBQ. You will enjoy the 360° view from the salon or the fly bridge which seats five. All the key equipment for comfortable cruising … generator, air/heat, windlass, ice maker, BBQ and new custom swim platform with davit system!